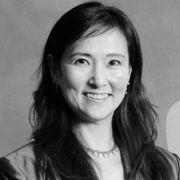 Erica Mina Okada received her bachelor’s degree in economics from Princeton University, MBA from the Tuck School at Dartmouth College, and PhD from the Wharton School at the University of Pennsylvania. Her industry experience includes investment banking at Merrill Lynch and project finance at GE Capital. She has held faculty positions at the University of Washington, University of Hawaii at Manoa, and at the Wharton School, University of Pennsylvania. Professor Okada applies behavioral decision theory and statistical methods to research in consumer choice and decision making. Her research has been published in top-tier peer reviewed academic journals including the Journal of Consumer Research, Journal of Marketing, Journal of Marketing Research, andMarketing Science. A recent article in the Journal of Marketing ranked Professor Okada 21st in research productivity among over 2,500 scholars nationwide and internationally who published in the leading marketing journals.